When spring is in the air, motorcycles are everywhere. 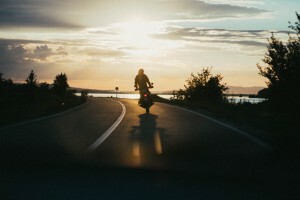 Do you long for the freedom that comes with riding on the open road? Then it’s critical to respect your machine and improve your skills throughout your lifetime. But that’s only half the story. Motorists interested only in four-wheeled vehicles still have a major responsibility in keeping motorcyclists safe on the road. Drivers: Do You Ever Think About Motorcycles? The vast majority of vehicles on the road are not motorcycles. They’re cars and vans and trucks. It’s quite possible that as a driver you rarely think about motorcycles. Why do drivers often violate motorcyclists’ right of way? Driver education programs should emphasize these issues – especially in programs for mature drivers who may have diminished abilities. If you’re going to ride a motorcycle, it’s important to commit to a lifetime of learning new skills and brushing up on the old ones. The Motorcycle Safety Foundation offers safety booklets, downloadable Rider Course handbooks, videos, quick tips, white papers and more. They also can help you find a motorcycle safety course near you.